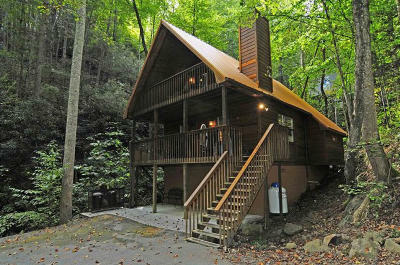 Nestled beside a mountain stream, this cozy 2 bedroom, 2 bath chalet is only about a mile from the first traffic light in Gatlinburg. Nicely updated with oak flooring, handsome furnishings and tasteful fixtures. Versatile outdoor space includes two covered decks to enjoy Smoky Mountain rainfalls while watching the creek flow. There is an open deck with a hot tub overlooking the stream. Two levels with vaulted ceilings, open loft and a mountain stone gas fireplace. This chalet is used as a two bedroom, each with a separate bath. There is a bedroom/bathroom suite on each floor + an open loft. This chalet produced $23k in 2017, and $33K in 2018! The roof is only 4 years old! Hot tub was replaced in 2016!